He flew me in a small single engine plane from New Jersey to Maryland. I grew up from what he called a tiny little mitten kitten into a big 16 pound cat. 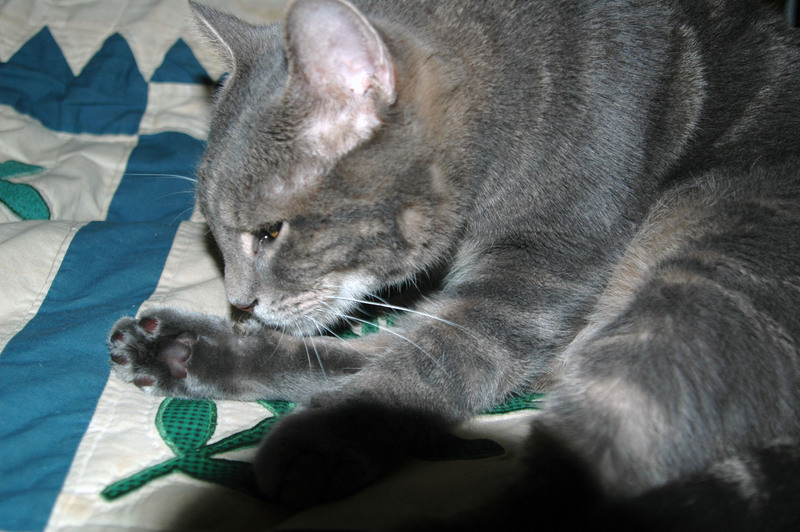 Other than having me fixed, the only other medical procedure my human had to do is have my front dew claws removed. Because my extra toe is like a thumb, the dew claws kept growing into my paw pads. They were causing me a lot of pain so we had them removed. In the fall of 2010, I had to endure another plane ride. This time it was on a big plane, and we went from Maryland to San Diego. I was all set to enjoy a life soaking up the Southern California sun, but then something else happened. I was diagnosed as a diabetic cat in the summer of 2012. Being a diabetic cat’s human means that you can no longer do what used to be possible with a cat. It means that you need to schedule things around your diabetic cat’s needs. I need to have two insulin shots a day. And before those shots, I need to have tests to determine my blood sugar level. After I was diagnosed as a diabetic cat, my human also had to alter my diet. He had to reduce the amount of my food that was dry food and increase the amount that is wet food. Even a high quality dry food is going to contain a high percentage of its calories from carbohydrates. Just like diabetic humans, diabetic cats can’t have this. But even these challenges are not too difficult to handle. While diabetic cats need more attention and care than cats without the disease, there is nothing wrong with our hearts. For a human who can give us the extra care and pay the extra expenses, we are great cats!